This represents '#pragma omp target teams' directive. 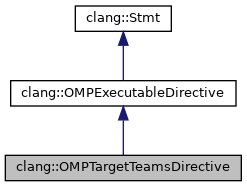 In this example directive '#pragma omp target teams' has clause 'if' with condition 'a>0'. Definition at line 3760 of file StmtOpenMP.h. Definition at line 3806 of file StmtOpenMP.h. Definition at line 1572 of file StmtOpenMP.cpp. References clang::ASTContext::Allocate(), clang::OMPExecutableDirective::setAssociatedStmt(), and clang::OMPExecutableDirective::setClauses(). Definition at line 1587 of file StmtOpenMP.cpp. Definition at line 3761 of file StmtOpenMP.h.